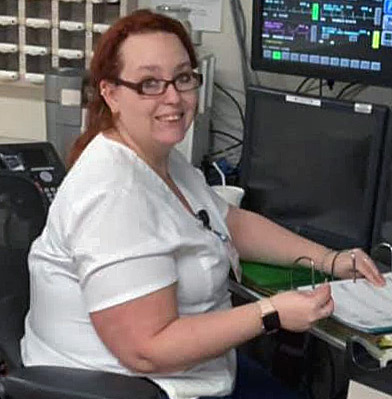 CLAY COUNTY, Fla. - The 30-year-old mother of five who died Saturday after her SUV left County Road 217 and overturned several times had fallen asleep behind the wheel while headed home from working an overnight nursing shift, her husband told News4Jax. The Florida Highway Patrol said Caitlin Magliochetti was driving south just after 8 a.m. when her Hyundai Santa Fe left the road just before Memory Lane. Troopers said she overcorrected and the SUV began to spin, entered a water-filled ditch, hit a concrete culvert and overturned several times. "She was almost home," her husband, Hector Magliochetti, said. She was coming home after two overnight shifts in a row as a registered nurse in the cardiac unit at St. Vincent's South. Magliochetti's family said she was a loving mother and hard-working woman willing to help anyone and everyone, so it was appropriate she chose nursing as a profession. "She had a loving heart," said her mother, Kathryn Booth. "She helped everybody. Anybody ever needed help, Caitlin was always there." Booth is now having to make plans to bury her daughter while helping comfort her granddaughters, ages 11 months to 10 years old. "I can’t believe this is happening," Booth said. As timing would have it, Booth said nursing was the topic of their very last conversation. "She had got me a job at St. Vincent’s," Booth said. "I had called her and asked her when it was starting. I know the supervising nurse had told me, but I just don’t remember." "When people come to the door, they are looking. They are looking for her to come home and it’s hard to tell them she is never coming home," Booth said. "They will always remember her mom. They will know who she is." Hector Magliochetti said he's trying to be strong for his girls. "Going to sleep is hard. I wake up a lot. I sleep with the girls -- I let them sleep next to me," he said. Hector Magliochetti said they had survived some good times and some bad times. "She was my rock. She held me. I held her. We were struggling and we pulled together, now we own this." A few years ago, Habitat for Humanity helped the family get back on their feet. "We been here almost 5 years," he said of their home. "We lived in the shed when we started the program, a little before that." He said his wife still volunteered for the organization. The family has set up a GoFundMe Caitlin Magliochetti Memorial Fund to help with funeral expenses.